In the United States, health care expenditure accounts for nearly 17.5% of the gross domestic product and continues to rise. Although many technological and therapeutic advances are worthy of praise, the quality of care delivered is nowhere near the level expected or desired from this investment. Cardiovascular medicine, in particular, has benefitted enormously from the investment in scientific discovery and clinical research; yet the timely, systematic translation of new knowledge into clinical practice remains a challenge. 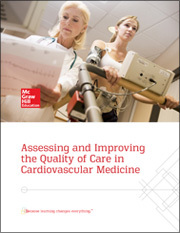 This white paper examines the quality of care in cardiovascular medicine and the frameworks that are in place to measure the achievement of quality care for cardiovascular patients. Fill out the form to download the white paper. ©2016 McGraw-Hill Education. All Rights Reserved.